The term sculptural has haunted Frank Gehry for much of his spectacularly successful career. While his supporters may use it in effusive descriptions of his building’s formal expressiveness, in the hands of his critics, it has become a potent means of implying that his designs lack the formal rigor that one should expect from architecture—another way of saying that the wild shapes that have made him famous are arbitrary, unmotivated, even willful. It is surprising, then, that his work appears most deliberate—and most grounded in deeply architectural processes and problems—in precisely the form that might at first seem most sculptural: the so-called process models that play a primary role in his approach to design. Some thirty of these tabletop-size objects were recently on display in “Frank Gehry at Work,” at Leslie Feely Fine Art, and many of them were hardly recognizable as architectural models. In the field of architecture, the model is typically a tool for definition and clarification, a means of precisely articulating spaces that were ambiguous or undefined in other modes of representation. As such, models tend to increase certainty, funneling ideas toward a final design. Gehry’s models, in contrast, abandon clarity and precision to multiply possibilities. Their overall massing tends toward lumpy, twisted shapes made from a motley array of cheap materials,such as wood, metal, paper, and canvas, which are often juxtaposed with more refined elements (from metallic paper to mirrored Plexiglas) that introduce an astonishing range of material effects. The models are only loosely suggestive of buildings, yet moments in their construction—strips of cloth layered over a wooden superstructure, an intersection between solid and hollow volumes—suggest both tectonic and volumetric logics even as they stop short of projecting a singular built reality. This open-ended, provisional quality is foregrounded by highly visible traces of their assembly: clumpy beads and stringy wisps of hot glue, ubiquitous scraps of tape. These pieces might be deemed sculptural because of their raw materiality and formal eccentricity, but such a conclusion would disregard their underlying architectural qualities. The most truly sculptural model in the exhibition was Sonderborg Kunsthalle, 2010, a study for a small museum in Denmark consisting of a single, artfully crumpled sheet of lead; its materiality and slumped geometry recall a miniaturized version of an early Richard Serra. As formally evocative as the work may be, however, its uniformity lends it a cohesive, finished quality at odds with the physical heterogeneity fundamental to architecture—even the simplest building is assembled from countless parts of wildly varying sizes and materials—that the chaotic assemblage of most of Gehry’s models engages so well. 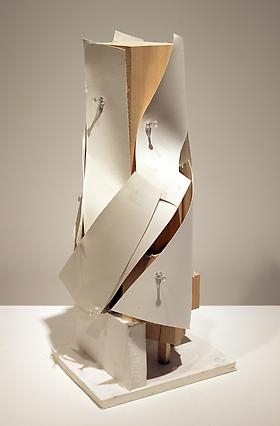 Take, for example, Miss Brooklyn Tower Study, 2004, a model for an unrealized project in New York City. Here, a rectangular basswood volume is surrounded by swirling strips of white paper, held in place only by clear pushpins. Their attachment implies contingent placement, revealing that this particular configuration is only one among many iterations contained within the model. This productive indeterminacy renders it not so much a sculptural object for display as an architectural tool for design. Such an object is a true working model: It embodies a methodology. At their best, Gehry’s models posit an approach to making architecture guided less by attempts to illustrate a priori ideas than by efforts to explore spaces and structures in real time, allowing them to emerge from the contingencies and idiosyncrasies of direct material experimentation. In this way, his models are a powerful argument against accusations of frivolous sculpturalism, as even his most bizarre forms are deeply grounded in this process. If his buildings themselves do not always sustain the energy and focus of these studies, this is perhaps due to Gehry’s overly literal translation of model into building, in which he relies heavily on digital technologies of design and fabrication that may arrest, rather than adapt or extend, the fluidity inherent in the studies. But one would be hard-pressed to find such a radically flexible architecture in built form anywhere today. In this sense, Gehry’s models issue a challenge to which all contemporary practices—including his own—would do well to respond. Read the original article here .